In general, Karou has managed to keep her two lives in balance. On the one hand, she’s a seventeen-year-old art student in Prague; on the other, errand-girl to a monstrous creature who is the closest thing she has to family. Raised half in our world, half in ‘Elsewhere’, she has never understood Brimstone’s dark work – buying teeth from hunters and murderers – nor how she came into his keeping. She is a secret even to herself, plagued by the sensation that she isn’t whole. Daughter of Smoke and Bone was January’s book club book. It was my second choice, but when I really looked at it, I was quite gutted we’d chosen it. I didn’t really have an interest in reading it. It seemed very sci-fi/fantasy-y, and Young Adult, which I’d always say I’m not really into (yes, I know the last book I reviewed, and loved with The Hunger Games: Mockingjay). One Saturday I forced myself to start it. And didn’t stop. I read all day. I stopped to make dinner. In the evening I started watching TV, but it didn’t hold my attention, as DOSAB was on my mind. I had to carry on until I fell asleep, then when I woke up, I couldn’t stop myself from reading until I finished it. As you can tell, I loved it. From the beginning the story really drew me in. Kauou wants to be able to live a normal, human, life, without interruption from Brimstone. But he, along with his other ‘Chimaeras’ are the only family she’s ever known, so how can she give them up. She’s Brimstone’s courier, travelling the world (through the door from his shop which opens to many different countries and cities across the world), to collect his ‘gems’, but he asks too much of her, and she often has to leave Prague for hours, days, sometimes even weeks and isn’t able to tell her friends why. However things start happening that may lead her to having to make a decision. How can she choice Brimstone and ‘her family’ though, when all she’s seen of ‘elsewhere’ is his shop – she’s only been allowed through the door to earth, not the other side. On top of all this, she wants to know who she is, who her parents are, and how she came to live in Brimstone’s world. The best thing about this book, is it’s the first of a trilogy. Two more books. How brilliant is that! I’m really looking forward to reading them. It seems I love YA Fantasy/Sci-fi series’ – which I should have realised before, when I consider books from the Hunger Games’ and Delirum series’ were among some of my favourite books of the 2013 (and 2012 – I read one of each in each year!). The book is mainly set in Prague, but travels other countries and continents, and of course to ‘elsewhere’ and beyond, so it fits perfectly into the Antartica/Other Setting category for the ‘Global Reading Challenge’ I’m doing this year. 1 down, 6 to go. I forgot to check in last week. I’m planning on one check in a week, at the end of the week, so Sunday. Last Sunday I totally forgot, so was going to do Monday, then work got in the way and I kept forgetting again, and now we’re here, a week later. Really, this is 2 weeks worth of check ins. – Spend some time at least three times a week, editing. I’ve been pretty good at this. Mainly cause I’m just on the reading through stage (to remind myself of what the hell the novel is), so it’s easy at the moment. I think I’ve done this at least 3 times a week for the last 2 weeks. I’ve read up to p60 this year (A4 pages, size 10 font, single line spaced – so quite a lot). I’m getting near-ish where I have to do some real editing. That’s scary, but I’m on a roll, so I’ll carry on. – Exercise three times a week. If it’s walking, no less than for 20 minutes. I went for my first run of the year today. I’ve been putting it off for a week, but I finally did it, and it wasn’t as hard as I thought – in fact, I’m a lot fitter than I expected considering I’ve not done any exercise other than walking for nearly 4 months. I’ve also got back into the habit of getting off the tube a stop early and walking the rest of the way to work. It’s only 12 minutes, but that’s 12 minutes more than I was doing. – Fast 2 days a week (500 calories a day). Done. I was going to do 3 this week, but today pretty much fell apart (I want to blame someone, but really can only blame myself, I caved in to the cookies I made last night, then left a pizza out the freezer, so had a choice of eating, or throwing away, I chose eating!). – Check in for ROW80 once a week, one book review blog once a week. 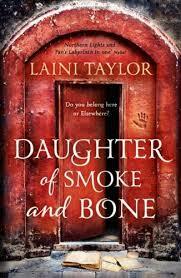 This week, complete – this blog and I reviewed Daughter of Smoke and Bone by Laini Taylor over on Novelkicks (read it here). Last week, I did none. I’m going to focus on the positives of this week though! All in all, I’d say I’m doing well (this week, we’ll ignore last). The editing is going well, the reviewing is going well, I’m blogging on time. I’m also exercising and eating like I should (I’ve lost 4lb in the last 2 weeks). My goals pretty much stay the same this week, except I may have to reduce to 1 fast, because life is likely to get in the way! Here’s to another good week!